This week’s recipe is super indulgent, it combines a classic cocktail with a traditional Italian dessert. 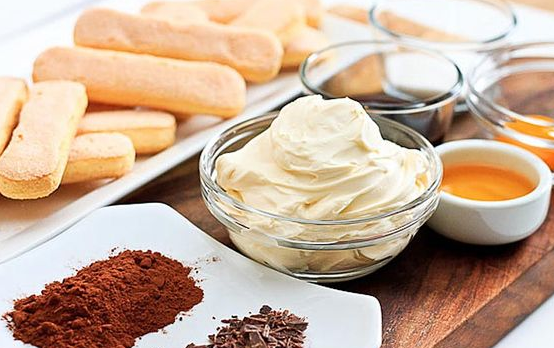 If you have a sweet tooth, this one will become one of your favourites no doubt! 1. Prepare the black coffee ideally in a moka pot and set aside in a bowl to cool down until warm. 2. Dunk the Savoiardi biscuits in the coffee and once a little bit soggy lay them on a baking tray to cover the whole bottom surface. Leave to cool. 3. Separate the egg yolks from the whites and keep the whites of 4 eggs in the fridge. 4. Whisk the egg yolks with the sugar vigorously until foamy and whiter. 5. Add the mascarpone cheese to the yolks and whisk until smooth. 6. Take the egg whites out of the fridge, add a pinch of sugar and whisk them until foamy and firm. If you turn the bowl upside down, the foam should not move! 7. Combine the mascarpone with the egg whites adding them little by little being careful to keep the mixture foamy. 8. Pour 75ml of the espresso martini on the Savoiardi that you left to cool in the baking tray. 9. Add 1/2 of the mascarpone cream in the baking tray on top of the Savoiardi and level with a spatula. 10. Mix the remaining coffee with the espresso martini and dunk the rest of the Savoiardi in it. 11. Place the drunken Savoiardi on top of the layer of mascarpone in the baking tray. 12. Add the rest of the mascarpone on top of the Savoiardi and level. 13. Sprinkle cocoa powder on top and you’re done! If you can resist eating it, you should leave it in the fridge for 5hrs before serving – the day after is even better! You can also assemble your tiramisu in martini glasses, just make sure to keep your layers. If you want to get the perfect amount of ingredients and a little extra drink for your Espresso Martini we can help! 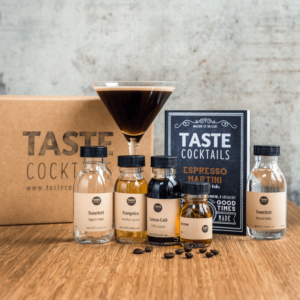 Get your TASTE cocktails box here and start mixing!